EXCLUSIVE RESEARCH: Integrators report earning solid profit margin for distributed audio systems, even though low-price expectations by clients is biggest challenge. 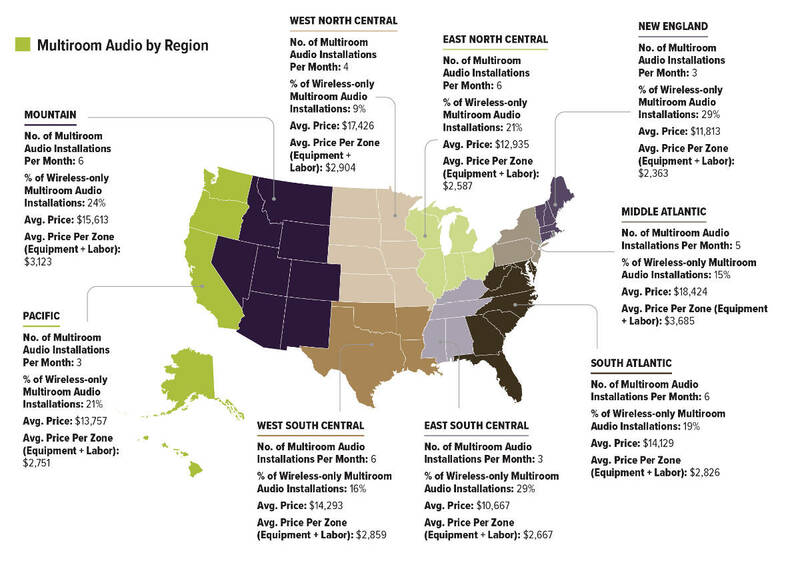 CE Pro Research: Integrators in the Northeast tend to require more manhours to install a multiroom audio system than those in other parts of the U.S. Getting systems in older homes for retrofits is a likely a big reason. 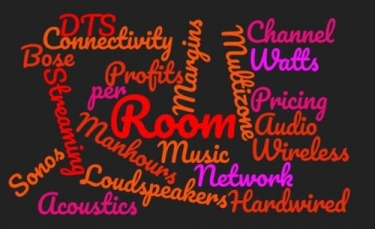 The multiroom audio market has changed dramatically over the past decade. When Sonos hit the market with a wireless streaming audio system, integrators (and manufacturers) scoffed at the idea consumers would flock to a wireless solution. Today, the market is still undergoing rapid change as new wireless options emerge and high-end hardwired systems are introduced. As integrators grapple with that dynamically changing landscape, CE Pro undertook the first-ever CE Pro Deep Dive Multiroom Audio Study detailing pricing, profit margin, wireless vs. hardwired, the biggest challenges faced, and much more… all broken down on a regional basis. Even with the proliferation of wireless multiroom audio systems, integrators tend to install more hardwired systems. The data can provide integrators with some solid benchmark information about the state of their own multiroom audio installation business. The average multiroom audio installation has six zones, 11 loudspeakers and has a final installation price of $14,662, making the average cost per zone $2,443. It takes a custom integrator an average of 19 manhours to install a six-zone audio solution, earning an average 38 percent margin on their multiroom audio installations (equipment + labor). Overall, the market for custom installation of multiroom audio is set to grow 9 percent in 2018. The typical multiroom audio system uses 50 watts per channel in power. 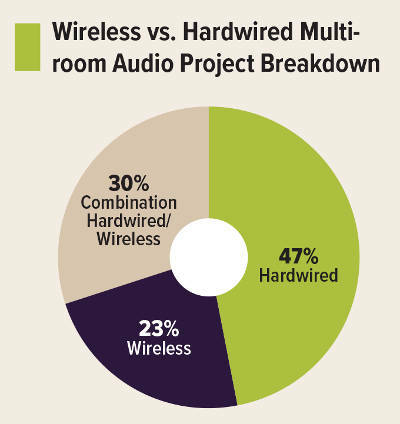 Even with the proliferation of wireless, integrators report that 47 percent of their multiroom audio installations over the past 12 months were solely hardwired solutions. That is compared to 23 percent exclusively wireless. The remaining 30 percent were a combination of the two. Audio quality remains the most important factor in determining which multiroom audio solution to deploy, followed by third-party integration capabilities, price and consumer-brand recognition. The biggest challenge integrators face is to provide a moderately priced audio solution that can integrate seamlessly with a whole-house control system. Indeed, 37 percent of dealers report that to be their biggest challenge. Extracting the multichannel audio from an HDMI pass-through is cited by more than one fourth of dealers as a serious problem, while powering subwoofers properly with a lower-end multichannel audio solution is list by 23 percent of dealers as a concern. Finally, providing high-resolution multicast streaming audio is also an issue for 14 percent of integrators. Voice control is just beginning to penetrate the multiroom audio space, with 12 percent of integrators noting they are currently integrating voice control. One-third of all multiroom audio systems are integrated with a multiroom video solution. Regionally, integrators in the Northeast require more manhours to install an audio system. That is likely due to the older age of homes, not to mention slowdowns due to poor weather. Integrators can download the entire report FREE.